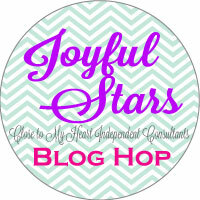 Welcome to my entry in the Joyful Stars Blog Hop for May of 2016. If you have arrived here from Debi's blog, you are on the right track! To create the flowers, I stamped my flower with VersaMark ink, sprinkled on some Gold Embossing Powder, and used our CTMH Craft Heater to melt the powder until it was shiny. I also fan folded half of a larger flower to create the little blue piece underneath the embossed flower. A Gold Bling Gem colored with a CTMH blue ShinHan Marker added the perfect touch. I hope you like my layout. I will be back with my remaining two layouts soon, so be sure to check back with me! Now, hop along to Krista's Crafty Corner, and I hope to have you visit me soon. Great layout. The papers are fabulous, even glossier in person. Your layout is so elegant. I love the gold embossed flower. Simple gorgeous! ooh! This is so beautiful! Thanks for the inspiration. Simple and Stunning! You have inspired me to get moving. Happy Times when you Celebrate With Cake!